BEFORE: Every now and then, I will watch groups of films based on directors, actors, or themes based on holidays, times of the year, etc. Today will mark the beginning of a run of Al Pacino movies. AFTER: As a whole, I typically like films set solely in one location. If done right, I find it extremely riveting to see how things unfold with a constraint on the location. 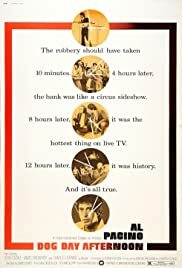 With Dog Day Afternoon, there was no funny business; it starts off immediately with the bank robbery. The rest of the film then deals with how Sonny (Al Pacino) and Sal (John Cazale) are going to get out. There were some side plot points that seemed superfluous and slowed down the pacing of the film but for the most part, the story carried itself and the one-location environment increased the suspense of Sonny and Sal’s situation.